A small update on the goings on of this clan…I’m sure you all have been waiting with baited breath. I am so thankful that summer is basically over. This summer has chalked up to have been pretty bad. We were going to continue to school through the summer but that got thrown out the window after my mom’s cancer diagnosis and subsequent death, my MIL moving to town and having to fix a massive leak in our bathroom. And when I say massive leak, I mean a massive leak. Like five gallons an hour….Yeah, my water bill shrunk drastically after that one. Labor Day weekend was the big moving truck to my MIL’s house in town from three hours away. We’ve spent a lot of the last week and a half helping her unpack. Today is only the third day since then that I’ve gotten to stay home all day long trying to tackle the massive amount of my housework that has piled up…And I mean massive. We started school again this past Monday finally. Well, book work. Life is basically school in my opinion. This year, the girls are working with Horizons Math (Bugs in 1, Beans will be redoing K book 2), Explode the Code (finally found a phonics program that doesn’t drive the eldest to tears!!!!! ), I still have to order our extra subjects…cash has been rather tight. But I will be getting Mystery of History volume 3 yet. We have Eat Your Way Around the World to be an introduction to cultures of the world which we will tie into geography and missions. At church, we are currently doing The Story so I will be using that for part of our Bible, adding in the second in the What we Believe series by Apologia and am still looking for something else to go with it. I’m thinking the Grapevine Studies would be good for the girls. I’m also considering an art course on DVD for the eldest. She loves that sort of stuff. And since we hardly made a dent in the Apologia Exploring Creation with Botany last year, we will do that again. Today I finally made it below 230 pounds. Most of you don’t know but I’m a rather large short person. I topped out at nearly 260 lbs in the last few years. Yeah, that wasn’t good. I learned of Trim Healthy Mama back about Christmas time and was intrigued. I finally got the book in March. Since following pretty strictly in April (well, except for the massive amount of traveling, during the chaos of my mom’s death and funeral and several meals on those nights when we were too busy to remember to start supper) I have dropped below 230 as of this morning. I am trying to hit 199 by Christmas. Hitting that for my birthday would be even better, but that is in mid November and I’m not sure I can quite hit that. I hope to be blogging more of my THM journey to encourage others who are in the same boat I was in. I was always told by my family that I was destined to be large unless I got the gastric bypass surgery, that trying to lose the weight was pointless because it would just come back on like so many of my extended family members. THM is a lifestyle, not a diet. And one that I know I can stay on for the rest of my life. I have way more energy, I’m losing weight I thought I would never have come off, I’m having to replace my clothes for smaller sizes already, I feel terrific, my hormones are balancing themselves back out after years of being haywire. I am a THMer for life. So keep an eye out for THM updates, recipes and such and hopefully I will be able to start linking up on the Trim Healthy Tuesdays link up over at Stacy Makes Cents. So, what’s been up with you? We are on our third week of school already after having started on July 9. It has been so insanely hot that playing outside for any more than about two minutes causes melting, so we figured why not get a head start on the year? This way we can take off some extra time when the weather finally cools off and have a load of fun then. Besides, there is a huge Four Day Homeschoolers Conference/Fellowship/Field Trip coming up in September that we are really hoping to get to go to. 4 Days in the 4 States looks like a blast. Your choice as to which group to go with to different historical/art/nature sites, get to see six in three days, along with fellowship, food, music and the chance to see Finding Nemo in 3D. I haven’t gone over what all we have chosen this year for school. So this post shall do just that in case you are looking for curriculum yet or wanted to know what we were using. Some of it is a hold over from last year and review items we hadn’t finished off for various reasons. There are links for you to go see what we’ve chosen, however, none of them are affiliate links for me so I will not profit if you click on anything in this post. For Bible this year, we are finishing off Mighty Acts of God before moving on to Who is God and How Can I Know Him? and Princess Training. I wish I could have gotten the coloring books for Who is God, however, I know we’ll have plenty to do without them. I intend to do Who is God on Fridays with Princess Training done the rest of the week. We’ll do them until we are finished and then find something else for our Bible time. For history, we are continuing with the The Mystery of History Volume II. We love how it is presented in chronological order from creation forward. The activities are easily adaptable to my children’s levels. The projects are easy to adapt and so is the timeline and the note card option. There are only three lessons a week plus doing the timeline, note cards and projects so you can make this curriculum fit into your schedule quite easily. To introduce creative writing and some grammar, we are using the Primary Arts of Language; Writing (includes All About Spelling). We have done several lessons with PAL, and let me say, it is amazing. Both girls are thinking through stories, figuring out who the main characters are (and yes, Bugs who is 5 knows what a main character is and can point them out very quickly), what the problem(s) in the story is and recognizing the solution and even figuring out what the lesson to be learned is. This is an excellent program and worth every penny we spent on it. Spelling starts later in the program and I can’t wait. I’ve heard wonderful things about All About Spelling and how it teaches the why of all the phonetic combinations, teaches them logically and uses all of the learning styles to do so. We will also be occasionally tossing in First Language Lessons later in the year.Though my copy is the older one with level one and two inside, which I bought from a friend used. Math this year is Horizons K for both of them. Which after the first week, I realized I probably should have gotten them the first grade instead. Both of the girls are moving very quickly through the kindergarten program and we’ve been doing two math lessons a day. So we may be purchasing first grade math for them for Christmas. Beans will love that. She begs to do her math every day. Last year using her Beginning Mathematical Reasoning book, she actually cried when I would cut her off after doing three or four pages each day in it. I bought the complete set and an additional set of workbooks for the girls. They are loving this math program. So far, I like it a lot too. It is easy to teach, you can find extras in your house to use for hands-on activities and so far it is going swimmingly. Both of the girls like how colorful the workbooks are, and I don’t find them obnoxious. Handwriting is again A Reason for Writing. Bugs is doing Level A and Beans has K. I love how scripture is incoprorated into the weekly lessons in level A after the review period. Bugs has been finding the review boring, but sitting and doing handwriting is not her favorite activity. Should would much rather be dictating a story or listening to one. We are continuing on with The Ordinary Parents’ Guide to Teaching Reading for Beans. We are moving slowly through it and I’m making Bugs help me teach the Beans her letter sounds to reinforce them for her. Bugs can read, quite a bit it seems, but not outloud. So, I will be starting Learning-Aids with Learning Link Technologies to get the two halves of her brain communicating better together. I can’t wait to start the exercises with the Bugs. I’m still rounding up a few items we need to begin and learning the program myself. (I was offered a review of the program, so stay tuned for more info on this program and how it works!). We are intending to finish up Vintage Remedies’ book for kids (which is currently not listed on their website). It is a great nutrition/health book which incorporates easily into Home Ec. For Art, we will toss in Artistic Pursuits K book. I loved their preschool book and this one looks like it is as much fun. Music is whatever we feel like looking into at this point. The girls absolutely love listening to Tchaikovsky. I’m hoping to get a few more of the CDs from Maestro Classics to introduce them to more great music. Next year probably Dad may begin introducing them reading music and keyboarding or guitar. He is the music guy in our home. I’m hoping to get some more of the Bob Books series. We have the first box and Bugs loves being able to read them. Add in some fun field trips like Prairie Day at George Washington Carver’s birthplace. This takes place on September 8 this year and is always quite a bit of fun. This year, Bugs will be old enough to earn a Jr. Ranger Badge we think. They haven’t released what all is going on for this year’s Prairie Day yet, but I’m sure it is going to be as fun as ever. We are also thinking of going to the Candy House again. That was a blast last time. The tour was great fun, they took the time to really answer questions and were so nice with the girls. If you ever get over to Southwest Missouri, take the time to get a tour of the Candy House. We also will be adding in fun stuff I’ve found on Pinterest. There are tons of great fun ideas for school, art, homemaking…Feel free to go find me over there and follow. I’m Created for Home there too. Crazy Life, curriculum, family, homeschooling, Motherhood, TPA Convention, TPA Convention Comments Off on We’re Home! Wow. this past weekend was great. It was horribly busy, but still kind of relaxing, I learned a lot and had a wonderful time at the Teaching Parent’s Association annual convention, meeting up with old friends and spending time with family. We got into Wichita at nearly one in the morning on Friday. Thankfully the girls went right back to sleep after they were carried in from the car and put down in their bed at Grandma’s. We got unloaded, made sure an alarm was set for the next day and then we crashed. It was quite the adventure getting to the convention center on Friday with the one way streets and most of them blocked off for the annual Riverfest. I got to attend quite a few sessions, wander the vendor hall and chat with people. I will say that this year it was very nice not having a lot of random strangers stop to give me hugs since our nametags state where we are from (last year was just a few weeks from the tornado and it was fresh in everyone’s mind). We got turned around trying to make it home that night and spent a half hour driving around trying to find our way out of the labrynith of one way streets. Saturday, my alarm didn’t go off, but thankfully I woke up at the time I had set it for. We leave a few minutes early so we could stop at HubbaHubba’s favorite donut shop in Wichita. We get there as they are literally closing the streets for the River Run. So we sat and ate our donuts and watched people run past who obviously never eat donuts. We make it to the convention center a few minutes late so we wander the vendor hall, chat with some vendors and purchase the bulk of our curriculum. Of course, time escapes us and we realize halfway through the second session that we were missing that seminar too…oops. Then it is time for lunch so we go and get lunch, enjoy the last keynote, attend the last two sessions and help my friend Betty pack up her booth. On Sunday we go to the church HubbaHubba grew up at and we find out that some friends of ours who moved from here recently attend there now. It was great seeing them and their children (the girls were ecstatic to see their friends). We make it home and have lunch and I crash. HubbaHubba came to wake me up at six. Monday we went to the Exploration Place where they currently have a traveling Star Wars Exhibit. HubbaHubba and Beans went in to see it. Bugs didn’t want to go so we didn’t get the extra tickets for that and we played in the rest of the museum. We met the friends we saw at church there so our munchkins could have time together. We left after lunch time, stopped at Spangles (our favorite fast food in Wichita) and spent the rest of the day doing some chores at my Mother-in-law’s house. We finally leave at about eight at night and got home at midnight on the nose. We shuffled the girls in to bed (they never even noticed), unloaded most of the car and crashed ourselves. So, today is catching up on laundry, watering the veggie garden, cleaning up from just dropping everything into the living room upon arrival home and relaxing some. And hopefully getting all my reviews and postings done for TPA. I should go and fold some kitchen towels. And hang up our clothes. Plus I have to hammer in drainage holes in the old tin wash tub so I can plant it with lettuce. Maybe I should find room for our new school books too. Talk to you all later. I have to get to work! My girls love to listen to nearly anything presented to them. So, I was excited to have the opportunity to receive and review a copy of The World’s Greatest Stories. 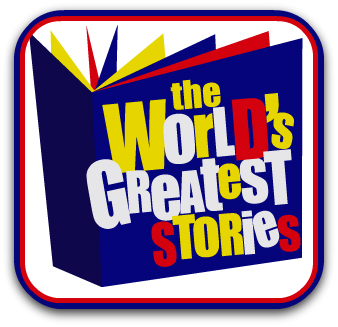 The World’s Greatest Stories is a collection of CDs that has the Biblical narrative dramatized. We are talking word for word straight out of the Word of God, in your choice of either NIV or KJV. The text is word for word straight out of the Bible and isn’t boring to listen to at all. Mr. Saris is a delight to listen to as he becomes the people of the Bible and the history of the stories comes alive as he narrates it. The girls enjoy having Volume One, The Prophets on as we go about our day. HubbaHubba is very particular about anything recorded. He loves to make recordings himself and is always picking apart recordings for what he thinks could have been done differently or better. Let me say that he was impressed with the quality of the production. He was leery at first since it seems that much of what is produced in the Christian realm isn’t done as professionally as it could be. We received Volume 1- The Prophets for our review. My favorite rendition was the telling of the Handwriting on the Wall. Also included in The Prophets is: The Blazing Furnace from Daniel 3, Daniel in the Lion’s Den from Daniel 6, Elijah and the Prophets of Baal from 1 Kings 17-18 and The Prophecy of Jonah. All in all, a delight to listen to either all at once as you are doing your daily routine or one at a time to help supplement your Bible time. At the time of this post, you can purchase any of the volumes (1-6) for $7.95 apiece, which is very reasonable for the quality of the recording that you will get. I intend to purchase others from The World’s Greatest Stories in the coming months. I wasn’t the only one to receive The World’s Greatest Stories for review, other members of the Crew did too, so go and see what others had to say. I received a copy of The World’s Greatest Stories, Volume One The Prophets by George W. Saris as a part of The Old Schoolhouse’s Crew. All opinions are mine and mine alone; no other compensation was received..